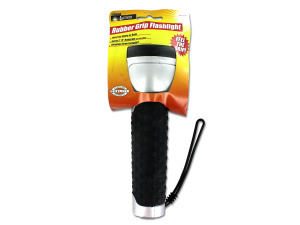 Silver plastic flashlight with black rubber designed for a secure grip. Has a slide on/off switch. 7 1/2" long with head diameter 2 11/16". Has a 4 3/4" rubber wrist strap. Requires 2 "D" batteries which are not included. Comes carded with UPC code. 25 pcs. 50 pcs. 75 pcs. — 100 pcs.